The Laker lost for the 14th time in their last 17 outings. 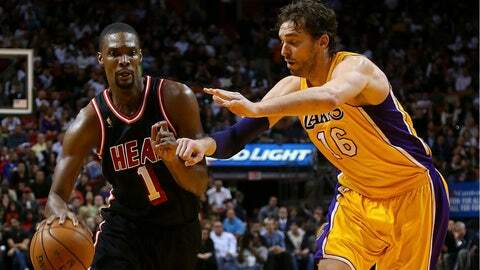 MIAMI (AP) — Chris Bosh scored 31 points, LeBron James added 27 points and 13 rebounds and the Miami Heat never trailed in a 109-102 victory over the Los Angeles Lakers on Thursday night. Mario Chalmers and Norris Cole each finished with 11 points to help the Heat beat the Lakers for the eighth time in their last nine meetings. Ray Allen added 10, and Miami shot 58 percent and outrebounded the Lakers 48-35. Jodie Meeks and Pau Gasol each scored 22 points for the Lakers, who lost for the 14th time in their last 17 outings. Nick Young added 19 points — needing 20 shots to do it — for Los Angeles, which nearly came all the way back from a 16-point second-half deficit. Bosh had the biggest shot of the night with 54.4 seconds left, head-faking his way free at the top of the key, stepping in and hitting a 20-footer to give Miami a 108-101 lead and making it a three-possession game. The Heat forced a miss on the Lakers’ next trip, then held on from there. The Heat improved to 28-5 when Bosh scores at least 25 points and 9-0 when he gets at least 20 shots, those records including postseason play. And with Dwyane Wade out again, Bosh took advantage of the extra opportunities. Miami was without Wade for the fourth straight game and 13th time in 43 contests this season, giving him more time to rest his oft-problematic knees. Allen started again in Wade’s place. Meanwhile, the Lakers started the same lineup for the third straight game, which for them in this injury-decimated season represents an actual accomplishment. Kobe Bryant, Steve Nash, Steve Blake, Jordan Farmar and Xavier Henry all remain sidelined, and yet the Lakers still wouldn’t succumb quietly in this one. They did, however, allow at least 100 points for the 10th straight game. Down by 16 early in the third quarter, the Lakers found a way to keep things interesting. Meeks had seven points in the third quarter, a dunk by Young got the margin to single-digits briefly and a three-point play from Gasol with 10:47 left got Los Angeles to 85-78. About a minute later, off Miami’s 15th turnover of the night, Young got a layup, the Heat lead was down to five and before long, James and Bosh re-entered to try and ensure the Heat wouldn’t totally collapse. Right on cue, Bosh scored to end the mini-rally by the Lakers, then forced a missed jumper by Gasol on the next Los Angeles possession, and Norris Cole weaved his way through the lane — treating defenders like an obstacle course — for a layup that restored a nine-point Miami edge, waking up a building that had been fairly quiet for a few minutes. One more time, the Lakers came back. Young’s 3-pointer rattled off the rim and down with 4:09 left, cutting Miami’s lead to 98-94, but Allen answered with a 3-pointer off an assist by James on Miami’s next possession. NOTES: The Heat improved to 7-6 without Wade this season. They’re 24-6 when he plays. … James is now within 13 points of catching Clyde Drexler for 28th on the NBA’s career scoring list. Drexler had 22,195 points in 1,086 games. Thursday night was James’ 807th contest. … The Lakers fell to 2-3 on their seven-game trip, while Staples Center is prepped to host the Grammy Awards. … Heat teammates roared with laughter in the third quarter when a commercial for Shane Battier’s annual karaoke night dubbed "Battioke" aired on the video screen.